Live call-in interview on CKNX-AM920 Radio with host Brian Allen to speak to the Stanford study, received calls from two supportive listeners and opportunity to speak about organic beyond the Stanford study. Met with Hugh Berges, Business Development OMAFRA, to discuss results of data collection work under our TPA and to call on the ministry to apply a “local food proxy” lens on programs under the proposed Local Food Act. Prepared for and hosted the monthly OCO Board Meeting, providing activity updates to our board members and receiving direction for way forward. Develop messaging for local and organic food from various consultative processes. Presented with Dr Ralph Martin “Can Organic Feed the World” as the first in this year’s “food systems” speakers series at the KPL sponsored by Waterloo Region Food Systems Round Table. Planning the Organic Dinner and Jazz Night Fundriaser to be held at Hart House, U of T on November 16th. Two generous sponsors confirmed – Organic Garage Oakville and the Canadian School of Natural Nutrition, as well as food contributions from Yorkshire Valley Farms, Fieldgate and Mapleton’s Organics. Hosted the Organic Council of Ontraio booth at the Canada’s Outdoor Farm Show in Woodstock, ON featuring Foodland Ontario Organic. Had lots of great conversations with organic and conventional farmers and distributed over 70 pamphlets outlining the steps to becoming certified to interested Farm Show delegates. 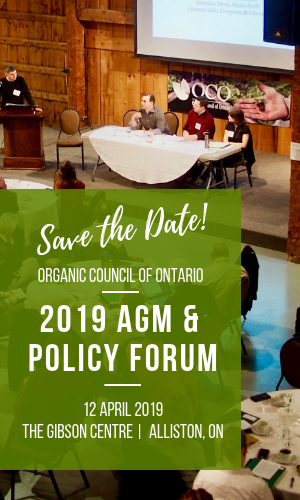 Hosted the first dinner of the Ontario Organic Dinner Series at Frog Pond Farm; a huge success with many great conversations amongst 40+ guests all enthusiastic about organic agriculture and desire for driving change to our agriculture policy. AMAZING meal prepared by Chef Jeff Crump and his staff of the Ancaster Mill featuring Ontario organics paired with wines from Frog Pond Farm and Organic Lug Tread from Beau’s.